Since being married I have learned rather well, the true value of a hot breakfast, missing mum’s parathas, pohas, idlis and Bournvita at just the right temperature. What I would give to wake up to a delicious breakfast every morning. Scrambled eggs and toast will do too! And so predictably, I have acquired a taste of appreciation for cereal. Not the weird flavoured ones, but the wheat flakes, corn flakes and muesli, with cold milk of course. Why have I only just taken note of this on the back of the box? Why, Kellogg’s, can I not have your muesli? Why can only a man, and one who knows where he is and where he’s headed at that, “reward himself” with your cereal? Why, Kellogg’s? What about women? Or men who don’t know where they’re going? Are they not worthy of your delicious royal treats? Do you not believe I have a “discerning” enough palate to enjoy muesli? Let me tell you by the way, you could do with less sweet! There, see? Discerning. Thank you for deciding that men deserve nutritious grains and hand-picked dried fruit to make them feel noble everyday, while us ladies get the fibre-rich Special K two week weight loss challenge. Yay! Well, at least you’ve taken it upon yourself to teach men how to make a bowl of cereal with easy to understand cartoons. Clearly, men who script their own success don’t know how to pour milk into a cereal bowl. Well done Kellogg’s, well done. 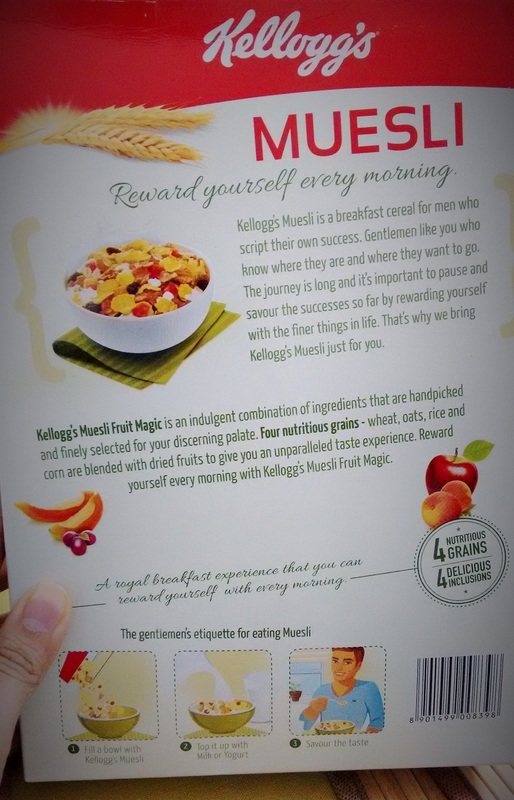 Kellogg’s has since updated the copy on their packaging, and their muesli is now gender-free!